The Arcanes 2 Il secondo grande volume dell’Opus Magnum del grande poeta americano. 190 lunghi componimenti scritti nell’ultima decade (2006-2016). Un’opera che fa la storia della poesia. In americano. The second great volume of the great American poet’s Opus Magnum. 190 long compositions written in the last decade (2006-2016). A work that makes the history of poetry. In American. 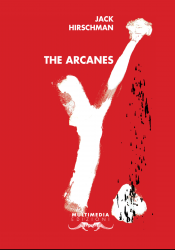 Introduzione Since 2006, when we joyously published Jack Hirschman’s The Arcanes he has been prolific in continuing to compose such poems, and so we’re ecstatic to publish The Arcanes (2006-2016), comprising 190 new Arcanes written for the most part in the past decade. That Arcane, based on a Vietnamese vodou sect, Hirschman regards as the foundational work of all 315 Arcanes, and we are most happy to have been able to bring them to you, the readers and admirers of Jack Hirschman’s works.